Just asking for a few good thoughts and prayers Gavin's way. His pediatric retina specialist at Children's Hospital LA is trying to get the hospital to "ok" the ERG. As many of you know, we are covered under his Dr, but not the hospital. His office is IN the hospital, which complicates matters. I'm hoping his Dr. can pull something off. I don't even care if the HMO picks it up, we have a PPO option that I'd be happy to even pay 20% of the costs. Which works out to be a lot, but it will put an end to this nightmare and put us on the road to finding the exact name of the disease robbing his sight, and we can begin the blood work and be put on the right path to what his future will look like, options if any, etc. And the list goes on. Let's hope this week brings us some closure to this 4 month long battle with our insurance. Yeah, I know. I'm late with this posting. I have to do a salute to my hubby for Father's Day, and shame on me for not doing it. Although, I don't feel too bad - this blog is only pretty much intended for Gavin only. It's not a general mommy blog with updates of both boys. I think that would only interest the grandparents... LOL! Maybe also a glimpse of me into our boring lives, ha! Anyhow, this past Father's Day was a special one and emotional one for many reasons. Many of our family members weren't able to wish my grandpa and my uncle a Happy Father's Day. They were both dedicated fathers and both recently passed away a few months ago. This is our first year of anything without them. And for Troy, this past year with Gavin has been full of ups and downs, and he is and continues to be the rock in the family when my emotions get the best of me. This is his first Father's Day as a daddy of two. He adores his boys so much, and both of our goals as parents is to spend as much time with them each day as possible. These moments will soon be gone, and we both get it. We both understand, and that is what I love about our family dynamic. We would rather be with each other with the boys, as a unit, than out with friends, etc... ALTHOUGH, yes, I understand, we need to get out and we are working on it. I just would rather not be anywhere else in the world than with all three of my boys, everyday and every night. Period. Troy shares this value with me, and I get such a kick watching him as he parents and loves our children. T, you are a wonderful father. The memories you are filling our children's lives with are the guiding forces that will help shape them into men one day. Thank you for your dedication to me and this household. We love you! The first pic is Troy, my dad and Landon. The rival continues every year with the Angels vs. Dodgers feud in our family. You will see my dad trying to cover up the Dodgers on Landon's shirt. The rest speak for themselves. The picture of Gavin with Troy are on my other memory card, so I will upload those as soon as I can. This is my dad's side of the family. Happy Father's Day to all you dedicated fathers. We appreciate you! Happy Father's Day dad, I promise, next year will be a much better year for you. I love you. If you are involved in a racing competition and would like to fight blindness too, check out the below link. With summer weather here, there are many people who involve themselves with races, triathalons, etc.. Why not fight blindness while you're at it? 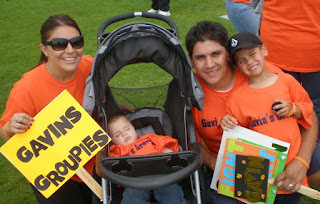 We were given high hopes on Friday that CCS (California Children Services) would be covering the costs that our insurance wouldn't be covering for Gavin's ERG. We were ecstatic. FINALLY a positive direction in getting all this taken care of. That happy moment lasted the weekend. We then talked to the person we spoke to on Friday's, supervisor. We were not approved. Medically, yes we were. Financially, no we were not. Now we are back to square one. The square we started back about 4 months ago. This has to be the most frustrating-not-making-sense-time in my life. I'm glad I have this blog to vent, so I don't unload it all on my poor husband. Square one. And even more confused and frustrated than ever. Thank you to everyone who has participated in my poll. PLEASE continue to send your answers. I am noting down all the "things" you would miss most if you lost your sight tomorrow. My little fundraiser idea to make money for the Foundation is coming more and more together - and YOUR answers are going to play a part in that. You can be anonymous. If you haven't participated, please do so. You can do it here as a comment, or email me, or on my Facebook page under "Gavin's Groupies". Thanks a bunch! And thank you to everyone who has participated, it's been enjoyable to read. PLEASE ALSO INCLUDE YOUR CHILDS ANSWERS. REGARDLESS OF HOW YOUNG THEY ARE. I am going to pose a question, and would like your input. There is a reason I am asking this question, really just not being nosey. Please post your response in the comments section, or in an email to me. I also posted this question on Facebook, on Gavin's Groupies group page. So if you've taken part there, no need to do it again. I will post my answer below, as well as my husbands and my 5 year old son. If you'd like to post your children's answers too that WOULD BE WONDERFUL! I have things running through my head to try to raise money for the Foundation, and so these answers have to do with that. Your name will not be used. Besides the obvious answer of your children, spouse, people in general... What are your top 3 things you think you will miss the MOST if your sight was taken from you tomorrow? 2. A rainy day w/ big scattered billowy clouds - but the sun peeking over the top and the sun rays shining down. 3. A running creek in the mountains with tons of foresty trees. (Yes, foresty). ;) With a gorgeous sunset in the background. 1. "Seeing everything at Disneyland"
3. "Seeing my RAZOR scooter in the garage, because it's my favorite thing to do. Go outside and ride my scooter." Ok, so I'm a total lagger. 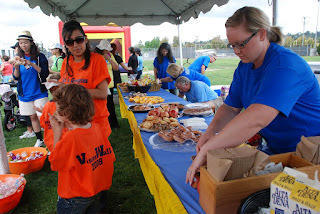 I haven't posted anything about VisionWalk that took place last Sunday. Before the pictures, let me explain a little bit about this event. It is the national signature fundraising event for the Foundation Fighting Blindness. They take place in different cities, nationwide. Cal State Fullerton was the destination for Orange County. I have been looking forward to this event for quite some time. The day we received the confirmation of our worry of Gavin, I was in a state of desperation. I've described this day before in previous posts, but I was frantic to find something. Something positive, something we can be a part of. 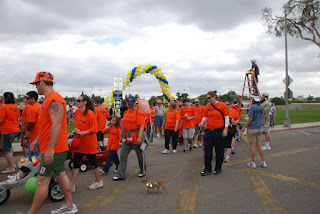 I came upon the website for the FFB, and then read about this VisionWalk. We jumped in head first. This has been near and dear to my heart. It has offset the sadness for a little bit, and we were able to focus on something positive, full of hope. Gavin's Groupies is our team name. We raised $8,775.00 in a few months (plus a few more checks of donations that need to be added in). We wore bright orange (I've told a few people we look like Home Depot employees. We had over 120 people on our team. We had a fun time, and I think a majority of us were inspired that day. 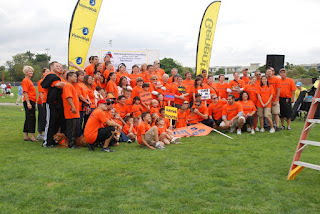 We were in the top 5 teams to raise the most money, and we won for largest group. It was nice to meet people I have been communicating with, but never met. I am finding more and more, positive people who come together for a common goal, is very inspiring. I'm glad I had my sunglasses on, my eyes were pretty misty throughout the day. It's impactful to see how many people who say they will join you, actually get up that morning, and make the drive to Fullerton to support a cause. It takes effort and planning, and on a weekend when it's much easier to stay home and relax, it's touching. Thank you to everyone who came to support. We hope to see you next year. Youngest of the "groupies"... still missing quite a few. Disc dog show. They're awesome! Important part of the group, man's best friend. A little warm-up to the Hokey Pokey dance. ....and we're off for our 5k walk. Landon and Austin leading the way. My nephew and Landon. Two peas in a pod, you would think these two were brothers. My beautiful niece holding the sign of hope! With your help, we are a step closer to a cure. Thank you all.. Already looking forward to next year. of what constitutes true happiness. Through the brilliant mind of Helen Keller, her quote sums up the past few weekends. I continue to say how blessed I am to have the outpour of support. I have said many times over how amazed I am by the compassion from people I don't even know. I have cried many tears over the graciousness of my family, friends and community as a whole. We have all banded together for a common goal. A goal that will be brought to fruition. A goal that IS atainable if we continue on the path we are on. It is because of YOU and YOU and YOU that fuels my fire to fight for a cure. To fight for treatment. To fight for all the families who feel as I do when they glance at their child, and their child doesn't lock eyes with them and smile because they see you smiling at them. The sadness I am reminded of daily of the visual impairment of my baby has slowly begun to soften. It is not as harsh, cold, or stomach churning. It is, though, still as difficult and devastating. That has not gone away, it will always be difficult. I cannot change what is. As we all know, what we can change is the future. The future is full of promise, hope and the ability to allow this process to take place. I can cry, we can cry, but we will not cry for long. The crying will hit the plateau as we edge closer to cures that robs thousands of children, teenagers, adults and the elderly of the most precious of all senses. There WILL be no more LCA, RP, Usher's Syndrome or the other many countless diseases that robs us of the ability to see everything we should. Every day when I look into my sons beautiful eyes, I am reminded. When I saw the way the sun was peeking through the clouds, and how magical it looks, I was reminded. I am reminded every day my child cannot see. It feels as if it is every moment that I am reminded. It is a constanst sense of urgency that is tugging at my heart. An urgency because we are on the brink of so many promising researches, breakthroughs and treatment. You have each individually AND collectively spawned an entire mission within my heart. YOU have validated our efforts. I say "our efforts", because if you are reading this, and you have contributed in some way by donating, walking, crying with us, or just being there along side us as we march through this phase in our lives, it is our efforts. You are a part of this mission, just as my husband and entire family is. We can change the world, and the way thousands see the world, in a way each individual deserves to see it. With vision, with sight, with hope. I am putting such emphasis on you, yes YOU reading this because I am just extremely hopeful for the future. We have such a strong foundation to stand upon, and that is the support from every single one of you. People I have not talked to in 16 years, people I have never met, the entire board of the Little League our family is involved in, who we just met this year has ANOTHER event they plan on doing to raise money. Past co-workers, my husbands existing co-workers, people who live in other countries who read this blog and email me with their kind words. It is every single PERSON who has played a part, and it is because of you, and my will to be damned my child goes through life in complete darkness that fuels my fire to move forward with my involvement to help Gavin, and those like him. I tirelessly thank you. I thank your involvement, I thank your support and I thank your compassion. This is only the beginning of many bigger things. Gavin's name, and his condition will stand for so much more, and will contribute to greater things in this lifetime of his. I am so proud of all of you for standing by my family and holding my sons hand so he knows you are there. You have all made a powerful impact in my life and in my heart, and with your continued help, we will move forward and accomplish great things. Great things for our child, but even greater for the world. "Gavin's Groupies" T-shirts are in! They look great. If you're in the area and would like to pick yours up, let me know. It would be easier if we were able to hand them out to everyone prior to Sunday, but we will be bringing the remainder of the shirts. 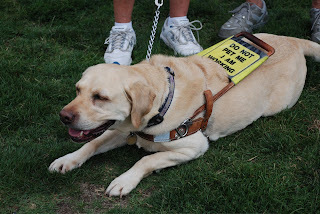 We would like everyone to wear them for the duration of the walk. If you have NOT registered as a walker yet, please do so. There is no fee for joining our team, it's all donation. 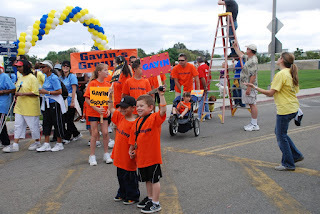 Click on the VisionWalk button to the right, and join as a member of "Gavin's Groupies". Registration will take a few minutes. It will make things smoother on Sunday, so we don't have to worry about registering you, but rather just checking our team in. The shirts are bright orange (like Home Depot orange). I'm sure it will be easy to spot us. Please bring strollers, wagons are fine, as well as leashed dogs. Once again, this is an easy 5k walk. Not a race. Bring comfy shoes! Let me know if you have any questions, we look forward to seeing you Sunday! PS - Please still sign up to join even if you have not informed me you would like to participate. It's not too late, and even though I am getting more people telling us they will be going, I may still have some extra shirts! We ordered extras, so please don't hesitate to come!!! Light refreshments such as fruit, granola bars, water and coffee. 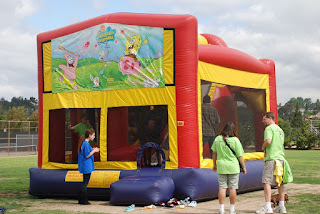 A Kid Zone area with face painting, hula hoops and a bounce house! An energizing stage presentation and countdown to the Walk! 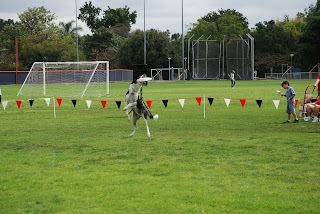 An awesome performance by the Disc Dogs of Southern California! Enough of my pity party rant. That little rant was my prelude to being behind with the updates with the insurance. As you may recall, we have been battling our insurance company for the past 3 months. They denied us of the surgery (ERG) the day before it was to be done. We spent the entire day in Los Angeles on Friday. We had a few appointments, and for times sake, decided to knock them all out on one day. We met with Dr. Lee at CHLA. We discussed Gavin, and the insurance issues, and walked out feeling a little bit more positive about the situation. Dr. Lee is totally on board, and with his help we hope we can accomplish what we need to get Gavin the services he deserves. Upon examination, there are no changes with Gavin (thank God). The thought of his condition getting better on it's own is non-existent in my mind, to be quite honest. I know what he has is very serious. That being said, I'm not trying to not be hopeful, but just realistic. I don't want a false sense of hope. The good thing is, the lesions on his retina remain unchanged. This is great! Great because it can be degenerative, and the few months that have lapsed since our last visit, nothing has changed. There are a few options in regards to our insurance, Dr. Lee has up his sleeve. Please keep your fingers crossed, at least one of these is the answer. Everything is at a halt. We cannot get our genetic testing done until we have the ERG done. We cannot get the ERG done, until our insurance clears it. UGH. Talk about frustration. The other side of this is, I want an official diagnosis. If it is LCA, as we suspect (and know what we are hoping for as oddly as that sounds), and it is with the RPE65 gene, clinical trials are happening that I have talked about previously. The diagnosis needs to be confirmed, and the gene tested, as well as our blood work, so we can put the pieces of the puzzle together and begin looking forward to what the future may hold. It is kind of like being stuck in single lane traffic, knowing the freeway will open up 3 miles ahead, but being in that "stuck" mode for the past months. We are waiting for our road to open to allow us to move forward. The not knowing is killing me. Having the official diagnosis will not change anything with how I am handling the business aspect of what we do day to day to broaden our horizon with research. But what it can do is allow us to zero in on specifics that relate to the disease. LCA has possible instances of seizures, etc.. No known instances yet with Gavin, but is things like this that bother me, without having the name of what he has. I feel like it will certainly help me understand him further. It's hard to explain what I feel. I know what the result of what he has is. That is visual impairment. Not knowing what is causing that, where the gene is, what gene it is, etc... is excruciating at times. We also had an appointment with the child psychologist. This time it was for Landon. He has told me, on a few occasions he is very sad about Gavin. This was said completely out of the blue. I decided it would be best to have Landon speak to her. She did some play therapy with him, observed some of his drawings, etc. It was informative. She says he is ok, but does get a sense he is a little sad. Possibly of the unknown. He also told her he gets very sad when he sees mommy cry. Yes, heartbreaking. Poor little guy, I felt very sad for him at that point. Knowing on his shoulders, he is sad for his little brother, and also worried about his mommy when he sees her cry. I haven't seen any change in his behavior, he is such a happy 5 year old who loves and teases his little brother just like any other sibling. I know it's an ebb and flow of emotions he is experiencing. I go through that daily, and I can relate. WE walked away with a little bit of homework, and some big insight for me. We also had Gavin's Braille visit happen, as well as his teachers who assessed him from SB schools. I need to run, and can't elaborate, but will save for another post. Gavin is officially a student!